This painting is clearly a copy of a painting named Dockstabonden 1911 according to image material that Gallery JT Ltd has got available. 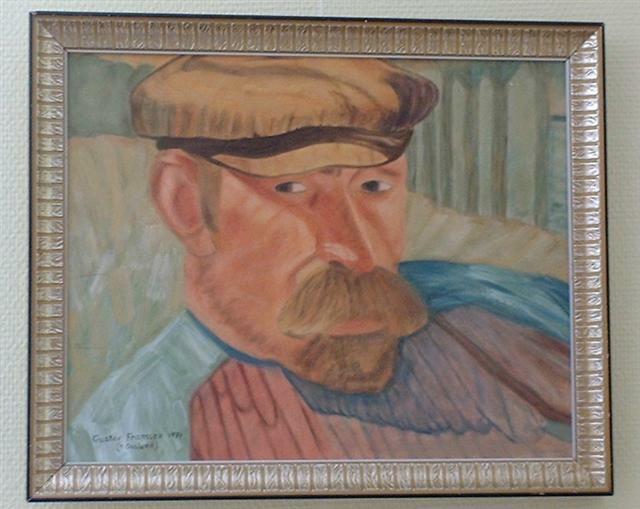 It is unknown if the copy is painted by Helmer Osslund himself or not. One main theory is of course that the copying artists name was Gustaf Fransson. The signing lacks the ordinary letters cop for copy. The artist Helmer Osslund sell for high amounts at international and modern fine art auctions in both Britain and in Sweden! An opportunity for the art collector and or investor! The painting is signed 1934 and the number three looks like number 7 from a distance but when carefully examined you can clearly see that the number is 3. The artist has used a layer of white colour both in the left and right part of the painting and a little bit of the number three is partly covered by this white paint which makes it look like number seven. Helmer Osslund is known for having been a broken man and he lived very poorly. For instance he used thin oven paper to paint on and why did he sign his name in parenthesis? -Well it is also told that Osslund was a bit shy and reserved and it is known that he often signed his paintings on the back of the paintings. 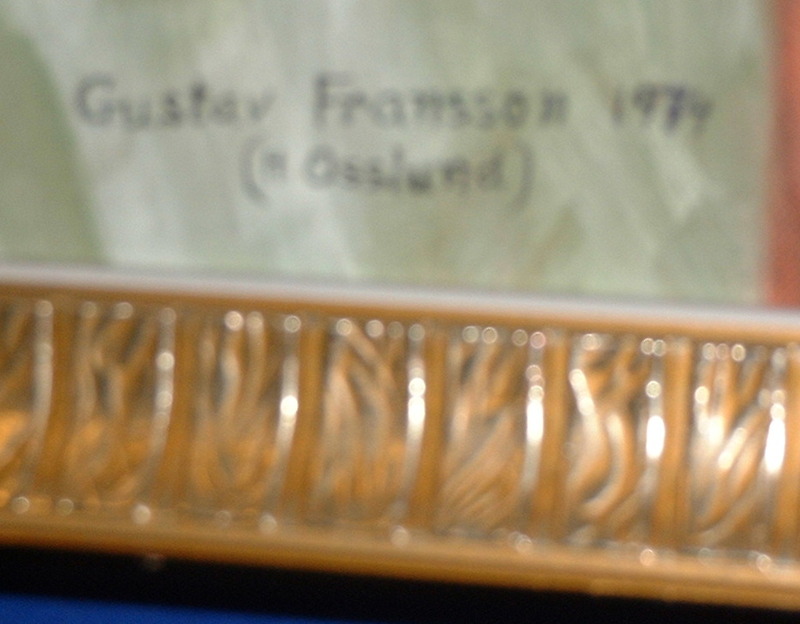 The name Gustav Fransson may be the man portrayed but Gallery JT Ltd has got no photographs on either Fransson or Osslund from the 1930ths. An extraordinary wealthy man named Gustaf Fransson is well known for having been giving a huge donation to the Swedish church. He lived between 1894-1984 and he visited America. Another Swedish man named Gustav Fransson with v in the name was born in 1886. It is known that Helmer Osslund visited America in his twenties. No record of his other eventual visits to the United States of America can be found. Oil painting signed Gustav Fransson 1934 (H Osslund),special offer, landscape paintings by Osslund has reached over a million Swedish crownes. Helmer Osslunds paintings has been called modern expressionism and Osslund was one of the predesessors to the new experimental painting in the 20 th century and he was strongly inspired by for example Gaugain. Notable pricei nformation: A painting by Helmer Osslund was sold by Bukowskis in Sweden for about 180.000 USD in 2008! Sothebys has sold several paintings by Helmer Osslund for about 39000 USD! Gallery JT Ltd sell fine art at better prices! Gallery Jt Ltd has no fees. Gallery JT Ltd does not allow hotlinking to images or copying of images or text: -See information about copyrights! This product was added to our catalog on Monday 09 July, 2007.